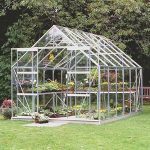 This is a fantastic looking silver aluminium greenhouse and is roomy enough for keen gardeners to grow many different types of plants, vegetables and flowers during the year. 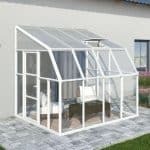 Coming in two finishes of either toughened or horticultural glass it is also possible to buy optional auto vents to help control temperature variations. 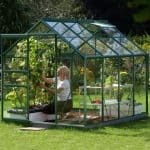 It is both long lasting and low maintenance and comes with a 15 year guarantee – a great purchase for the gardening enthusiast. 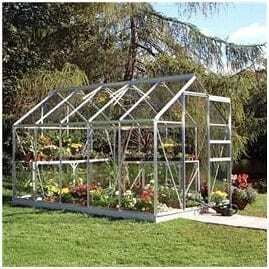 I used to garden in the conservatory. That was very small and I found it quite limiting. 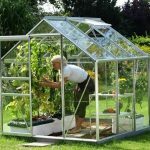 My neighbour showed me her greenhouse and that’s when I found this one. She and I assembled it with two blokes from our street so that wasn’t too hard. I am happy with the 15 year guarantee, it’s quite a good one given the weather here. So it was value for money for me. I can adjust the vents to work outdoors all year round without a bother. It’s something I’ll enjoy for years to come. 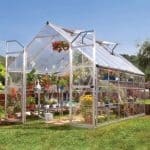 Horticultural glass is what I chose but I didn’t spot a real difference either way. It impresses me as a strong structure.